Take action. Let us handle your claims. Whether large or small, Action Claim Service is there for our client’s claims that need a prompt and professional response. We handle and adjust claims involving bodily injury, personal injury, casualty, and property damage for our clients. Our General Adjusters and Executive General Adjusters have years of experience and training that enables them to execute the job at the highest level in the claim’s handling industry. Our exceptional supervisors and seasoned, personable adjusters work closely with our insurance carriers to lessen the burden of excess claims. Action Claim Service provides industry-leading Property Loss Adjusting. We have the largest team of expert independent property adjusters backed by the strongest property claims management team in the Southeast and Midwest United States. Our claims experts handle both full and partial residential and commercial property loss claims. We have adjusters in place to handle large and very complex losses nationwide. These adjusters have great experience in this specialty line of adjusting. We also have experienced independent professional adjusters who handle smaller and more routine residential and commercial property losses in Alabama, Arkansas, Florida, Georgia, Illinois, Iowa, Kentucky, Kansas, Louisiana, Mississippi, Missouri, New Mexico, New York, Oklahoma, South Carolina, Tennessee, and Texas and other states. In addition to Residential and Commercial Claims—Action Claim Service also offers property appraisal and umpire services. Our general adjusters and executive general adjusters have vast experience with the appraisal process. Action Claim Service has been adjusting auto liability claims for our clients since 2004. Action Claim Service is the premier independent auto liability claims adjusting company in the Southeast and Midwest United States. We determine the extent of personal and property damage and the liability of the insured, and our expert general adjusters and executive general adjusters go the extra mile to ensure all claims are handled quickly and correctly for our clients—the first time—saving them time and money. Action Claim Service leads the way in legal professional liability claims adjusting. We handle claims for our clients in a timely and efficient manner, and hire and employ the industry’s strongest and most knowledgeable litigation management adjusters. Our adjusters understand and are able to integrate the role of the defense counsel, experts and the insured. We work hard to determine the liability and adjust claims filed against firms and legal teams for our clients. 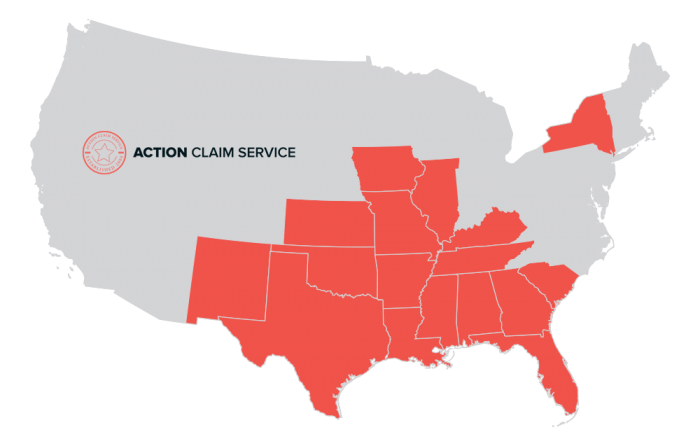 Action Claim Service enjoys healthy working relationships with many experts to close claims faster than any other independent adjusting company in the Midwest and Southeast United States. At Action Claim Service, we are professionals in the field of Casualty Claim Adjusting. At Action Claim Service, we are professionals in the field of Casualty Claim Adjusting. Our casualty claim adjusters work closely with our clients to properly handle each casualty claim. Action Claim Service handles casualty investigations expediently with a focus on gathering and preserving all items of evidentiary value. Reporting is timely and tailored to our clients’ instructions and needs. Action Claim Service provides these areas of expertise to all of our clients. Residential and Commercial Claims, Full Property Adjustments, and Appraisals available. Handled by adjusters experienced in this specialty line of adjusting. General Adjusters (GA) and Executive General Adjusters (EGAs) excel with large and complex property losses. General Adjusters and Executive General Adjusters have vast experience with the appraisal process. Casualty investigations are handled expeditiously with a focus on gathering and preserving all items of evidentiary value. Reporting is timely and tailored to our clients instructions and needs. Action’s Truck, Cargo, and Heavy Equipment Team(s) is ready for deployment 24 hours a day, 7 days a week. We have litigation management adjusters who understand the roles of defense council, experts, and the insured. Our large and complex loss services are available nationwide. Commercial, Residential, Property, flood, mobile homes, liability, cargo, investigations, accidents with injury, worker’s compensation, fraud, catastrophe, auto appraisal, apartment policies. Our independent adjusting services are available in Alabama, Arkansas, Florida, Georgia, Illinois, Iowa, Kentucky, Kansas, Louisiana, Mississippi, Missouri, New Mexico, New York, Oklahoma, South Carolina, Tennessee, and Texas and other states.